Probably you use standalone apps to edit photos on your computer. How would it be if you didn’t need to install those heavy programs? Great, right? Online photo editors offers this opportunity. In this post, I’ll discuss on 5 free online photo editors. I hope you’ll enjoy it and find this article useful to retouch your photos. Let’s start. Pixlr is considered as a good tool to edit photos online. It’s fast, free and responsive. The site has web, desktop and mobile apps. Pixlr web version has mainly 4 categories of services- Pixlr Express, Pixlr Editor, Pixlr O-Matric and Pixlr Touch Up. 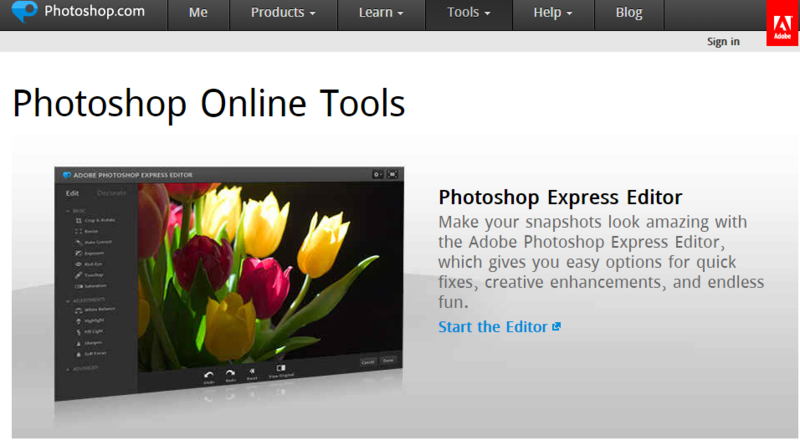 As stated by the site, Pixlr Express is their most popular online photo editing tool. It can be used to apply quick fixes, filters, overlays and stickers to beautify photos. Pixlr Editor is a robust browser based image editing utility that deals with nearly all of the editing needs including effects and layers. Pixlr O-Matric lets you apply retro effects on photos to make them cool antique pieces. Pixlr Touch Up is a Chrome browser extension that helps you give the final touches to edited photos. FotoFlexer is a free web based photo editing tool with lots of functions. The site claims that they offer the ‘world’s most advanced online image editor’ although I saw many users who were unable to agree with that statement. However, if not the best, FotoFlexer indeed is a good tool to get your photos edited online. You can upload images from your computer’s local drive or use cloud services like Flickr, Photobucket, Picasa Web Albums, Facebook, Myspace etc. Using FotoFlexer, photos can be given a better look by applying built-in customizable effects, inserting texts, shapes, distortions, layers etc. FotoFlexer also has some advanced features like Recolor, Curve and Morph. LunaPic is another free online photo editor. It’s ad-supported and comes with lots of editing options. 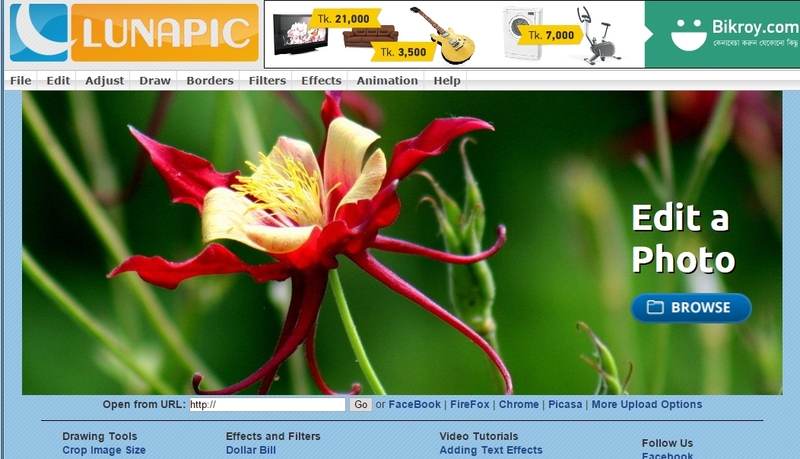 You will find LunaPic’s user interface as a blend of Photoshop/GIMP and web app. It’s not very confusing though. The service offers plenty of features that you may not need them all, but still it’s a good thing. You can upload a photo to edit or import from other sites like Facebook, Imgur, Tumblr, email, Picasa, web etc. LunaPic presents photo editing tools in a straight-forward way. 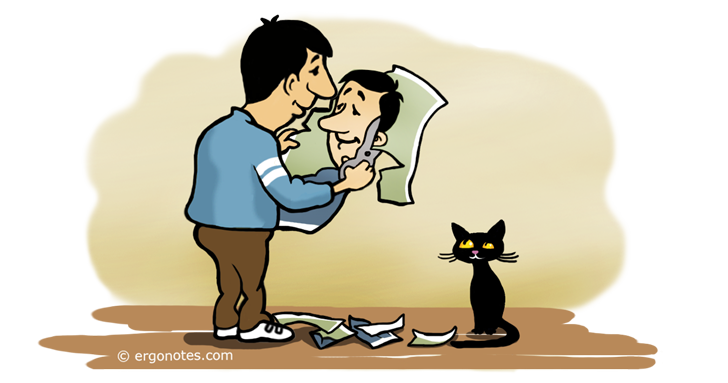 It contains options like Copy, Cut, Paste and so on in the toolbox. Other similar services may not offer these tools in this manner. The main website shows detailed editing tools under a few categories. But if you hover mouse on those menus, you will see long lists of tools. The editing utilities are further classified in two more ways such as drawing tools and effects & filters. The drawing tools come with crop, add text, add border and browse clipart options. Effect & filters lets you apply 200+ effects including reflecting animation, pouring rain, paste & blend etc. Sumopaint is one more web based free photo editor. It has claimed a position beside heavy standalone desktop apps like GIMP and Photoshop. Actually here you can get the basic functionalities of these famous programs. As we’ve seen in Pixlr or some other similar tools, Sumopaint also lets you start with an existing image or create a new one. The site provides both free and pro options. Free users can work with native SUMO, PNG and JPEG formats. I think this are okay for general web uses. The editing window of Sumopaint looks like Photoshop. It also has plenty of tools like Magic Wand, Clone Stamp, Lasso, Ink Tool etc. It’s fast and effective. Sumopaint pro plan costs $4 per month which unlocks some more features. It provides an offline version of the tool with dedicated technical support. 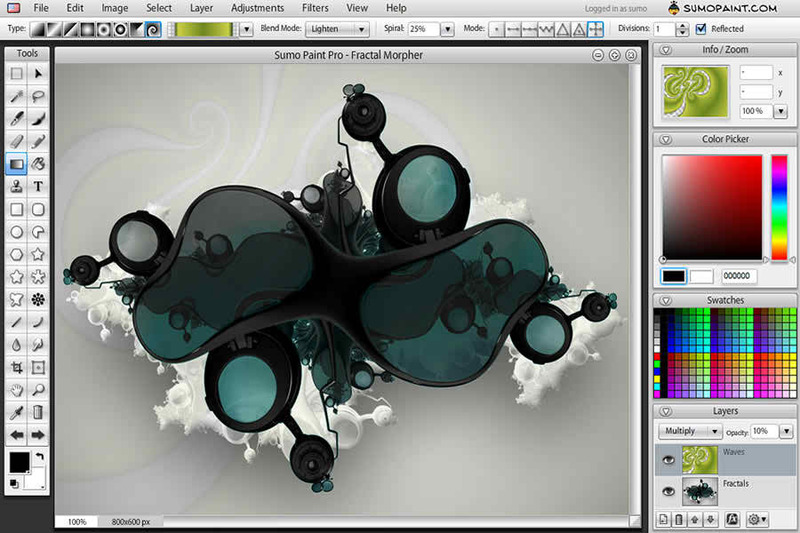 Photoshop Express is the free and online version of Adobe’s famous Photoshop program. This online tool is a trimmed down form of the standalone software. As it comes from the house of Adobe, the tool attracts many users for its brand value. Photoshop Express supports only JPEG files. It doesn’t allow creating a new image file and draw on that. So you get some limited functionalities in it. The user interface of Pixlr and most remarkably Sumopaint look similar to Photoshop desktop app, but Photoshop Express stands apart from this. So if you have used Photoshop on your computer before, that experience will help you more with these third party non-Photoshop tools. And this was in my collection for this article. Do you want to suggest a tool for online photo editing? Please tell us via comments. Thanks for reading. See you again!